At Dr. Christian Johnson DMD, we’re proud to offer the finest in comprehensive dentistry in and around Waldorf, MD. No matter the oral health or condition, our goal is to give each and every one of our patients a healthy and beautiful smile. While many people with missing teeth may feel like they’ll never be able to have an attractive smile again, we want to disprove that notion. As your trusted Waldorf, MD dentist, we offer both full and partial dentures in order to replace missing teeth. While most people are familiar with how removable dentures look, it’s also important to know how they work. 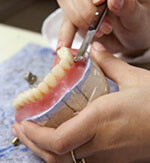 Removable dentures are actually held in place through a suctioning effect. The upper denture is benefited with extra support from the large surface area of the roof of the mouth. This allows the denture to be stable. Removable dentures can also allow a patient to maintain more youthful facial features; dentures will provide support to the facial bone and the soft tissues of the cheeks and lips. Dentures are made from impressions of your mouth. The laboratory will make the denture base from this impression and the dentist and lab technician will work together to select the artificial teeth that are the perfect size and shape. Your permanent dentures are then made for you so that you can restore your smile with dentures that fit well and look as much like your natural teeth as possible. 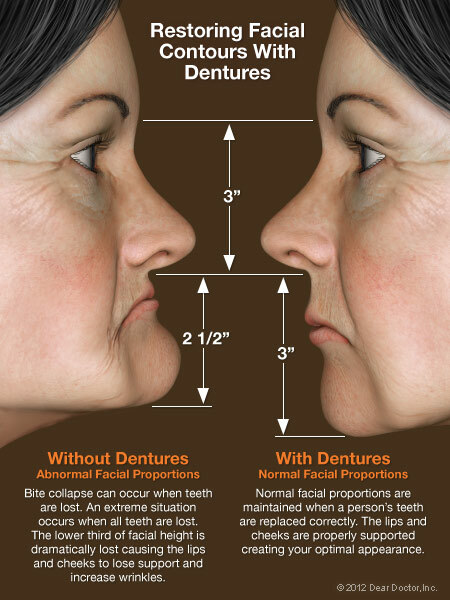 These are dentures that are worn for a short period of time before you start wearing permanent dentures. Because the gums are shrinking and the muscles in the mouth are still adjusting after tooth extraction, immediate dentures won’t fit as well as permanent dentures will after the healing process is complete. However, these dentures will give you the teeth you need at the moment and allow you to get used to dentures. The conventional full dentures are crafted to fit your mouth comfortably. They’re durable, long-lasting, and they function like natural teeth. In addition, they’re also created to match the natural appearance of your teeth as closely as possible. An upper or lower denture can be anchored securely by using two or more dental implants to increase the dentures' stability. The upper jaw will typically need more implants than the lower jaw due to its bone being less dense. Implant-supported overdentures are known to provide comfort and functionality. 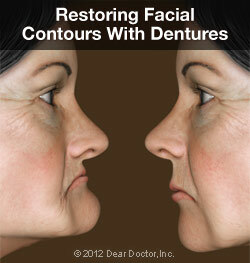 Transitional partial dentures are removable and inexpensive dentures that are made of a plastic material. These are meant to be worn temporarily in order to replace teeth and maintain space while you’re waiting for your mouth to heal after having teeth extracted. These durable dentures are made of a special metal material to make them lighter and better fitting. While they cost more than plastic dentures, they are still cheaper than fixed bridges or dental implants. It may take some time for a patient to get used to eating and talking while wearing removable dentures. After a period of acclimation, these functions become easier as the mouth adjusts to working differently and the patient becomes used to wearing the dentures. You can continue to enjoy all your favorite foods and you’ll never be afraid to smile in public again! If you have any questions about our removable dentures or our other Waldorf, MD dentistry services, please feel free to contact us. If you think you may be interested in our removable dentures or you’d just like to come in for a regular checkup, we encourage you to give us a call at (301) 645-3230. Alternatively, you can fill out our online appointment request form. We can’t wait to meet you and give you the beautiful smile that you deserve!